Last Saturday was one of the most special, remarkable days of my life. I left my house to go to what I was told was going to be a university function—and ended up walking into a crowd of singing, cheering Congolese, Kenyan and Rwandan women, who smothered me with hugs and kisses. They had been up before the sun, cooking up a feast and decorating a church sanctuary to honor me and my unborn daughter. (Yes, in case you missed my not-so-subtle bump in our live videos last week, I am nearly 8 months pregnant). It’s a hard experience to put into words… I felt so cherished, so supported, so… well, welcomed. As I prepare to embark on the journey of motherhood, I feel all the feelings you might expect. I feel excited, but anxious—downright scared at times. My mind is a constant buzz of questions. I don’t know this new road I’m traveling down and the place it’s leading me will be utterly foreign. Am I prepared? Will I be OK? Will there be anyone to help me when I arrive? Last Saturday was my airport pickup. I stepped through those doors, vulnerable and unsure, and into the arms of a community of welcome. They celebrated my arrival with shouts and ululations and singing. They held me as I cried. They spoke words of strength and encouragement to me. They welcomed me in. Friends, a Community of Welcome is a powerful thing. It has the power to move someone from vulnerability to security, from aloneness to family. It is so much greater than the sum of its parts. Each of those women on their own could have visited me to wish me well and bring me food and that would have certainly encouraged me. But by coming together and surrounding me, they gave me something to belong to. And that changed everything for me. That’s what we have the power to do together. Each of us on our own can be welcoming and generous and kind. But collectively, we can be a Community for our newcomers. We can be a circle of safety and support and kinship. That is what we are seeking to create here in Northwest Arkansas. That is what a Community of Welcome means to us. 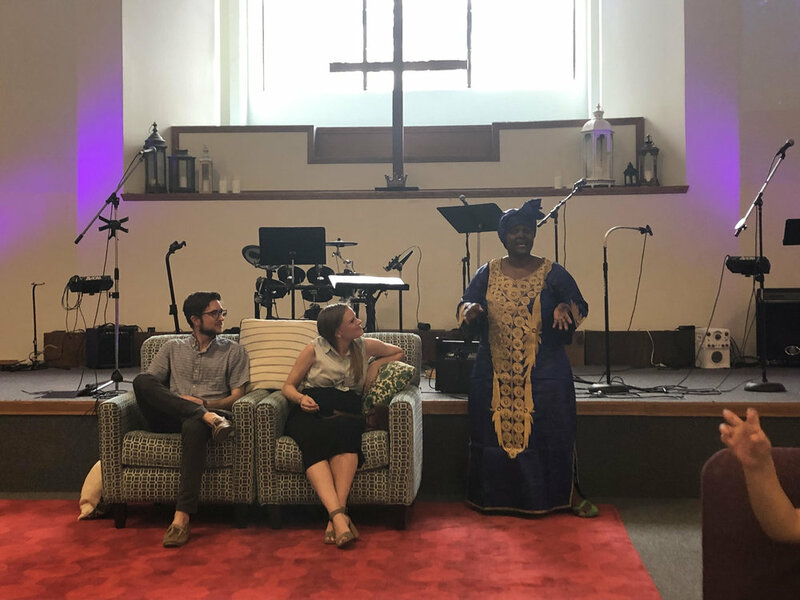 As we get ready to take on the challenge of building a Long Welcome for refugees in Northwest Arkansas, a strong, unified Canopy Community is more crucial than ever. We’d love for you to be a part of it in whatever way is right for you (check out all the options on our Get Involved page. There are more now than ever!). But this month in particular, we are inviting you to consider joining our Community of Welcome program, our innermost group of supporters. As a Community of Welcome member, you commit to supporting us financially every month, and we bring you in to our innermost circle. You’re the first to know the ups and downs of our work, you’re right there with us at our intimate gatherings and you get first access to our events and celebrations. Put another way, our Community of Welcome is the circle of women shouting, singing and hugging newcomers as they walk through the door. If that sounds like you, consider joining today. We’d love to have you.